Theanine is an uncommon and unique amino acid that is primarily found in green tea. It has anti-stress properties and has been found to relax people without creating drowsiness and without the agitation associated with caffeine. Pro Theanine is associated with supporting the healthy function of the mind and balancing mood. This is likely because theanine helps to support alpha-wave brain activity, which is associated with the relaxed and peaceful alertness that is experienced during meditation. Further, it increases the metabolism of dopamine and serotonin, which are associated with mood and mental function. 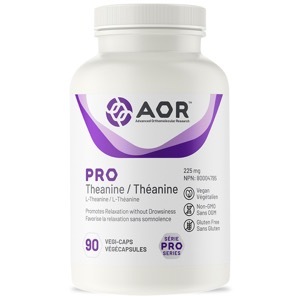 Pro Theanine provides an optimal dose of L-theanine to provide fast-acting mental relaxation, with its stress reducing effects typically felt within 30 minutes of consumption. Adult Dosage: Take 1 capsule daily without food.